Image sharing via social networks has produced exciting opportunities for the computer vision community in areas including face, text, product and scene recognition. In this work we turn our attention to group photos of people at different social events. People can guess plenty of implicit information from the visual aspect of a group of people, but what can we automatically determine about the social subculture to which these people may belong? We propose a framework that integrates state-of-the art person and face detection and uses low- and mid-level features to capture the visual attributes distinctive to a variety of social groups. 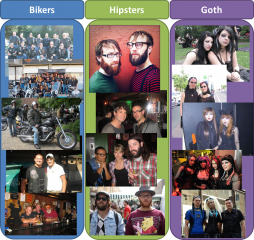 We proceed in a semi-supervised manner, employing a metric that allows us to extrapolate from a small number of pairwise image similarities to induce a set of groups that visually correspond to familiar urban tribes such as biker, hipster or goth. Automatic recognition of such information in group photos offers the potential to improve recommendation services, context sensitive advertising and other social analysis applications. Preliminary experimental results demonstrate our ability to categorize group photos in a socially meaningful manner. Some example results. Images with green borders are correctly labeled, while images with red borders are incorrectly labeled. All images classified as formal. All images classified as goth. All images classified as hipster. All images classified as surfer.